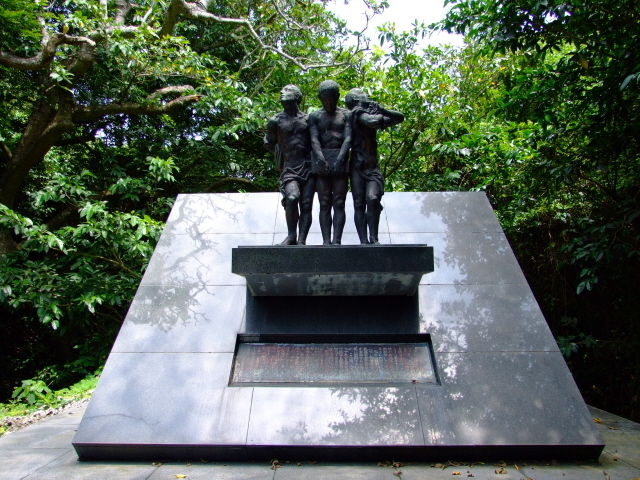 A monument for the boys of Okinawa Normal School who served (and mostly died) in the Battle of Okinawa, as part of the "Blood and Iron" Corps. These were called into action just a day before the US invasion of the islands started. Towards the end of the battle, the boys found themselves trapped by the advancing US troops at this location just off the southern tip of the island. Like so many others they were encouraged by the Japanese propaganda to commit suicide rather than be captured. And so many did just that. Others died from enemy fire or bombardment. Of the nearly 400 boys, well over half perished. 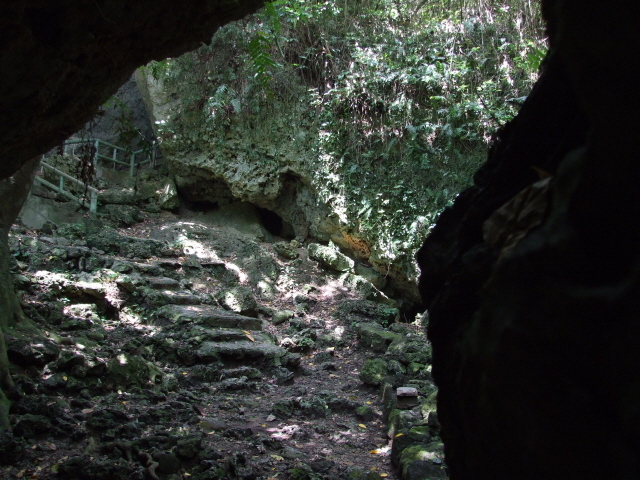 The hideout cave where many of them had sought refuge can be seen too, at the bottom of a path behind the monument. What there is to see: There's actually a set of several monuments at this spot, but the one that stands out is a statue of three young boys in tattered clothes standing on a plinth that protrudes from a slab tilted backwards 45 degrees. This is usually referred to as Kenji-no-To. Between this monument and another, larger monument of more a classic (obelisk-like) design, the path continues and eventually leads down some steps, descending towards the cave that the boys were hiding in and where some committed suicide. 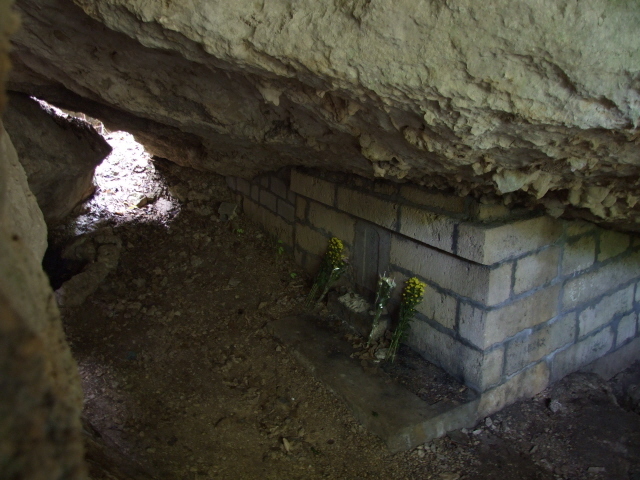 Under a huge block of rock there's a small memorial set in white bricks where flowers are frequently placed. Location: on the south coast of Okinawa, just west of the Okinawa Peace Memorial Park, off the main 331 road. Access and costs: free but slightly tricky to find. Details: just off the approach road (the 331) to/from the Okinawa Peace Memorial Park. It's not clear if it's accessible from there, even though it's just a stone's throw from the end of the park's Memorial Path and walkways on the top of the cliffs of Mabuni Hill … there probably are steps or paths down towards the Kenji memorial (I spotted a signpost reading "kenji-no-to"), but my guide took me all the way back to the museum first and then later drove me (in just a few minutes) to the site after our visit to the Peace Park/Museum. From the main road, a short marked access road leads to a car park with some tourist shops (which at the time of my visit in April 2009, however, were all shut). At the far end, between a low building and a hillside with steps leading up (don't use those), a footpath leads to the monuments, and a short walk beyond the monument the path and some steps take you to the cave(s). It's all accessible for free. Note that this spot is not part of the organized coach tours of South Okinawa's war-related sights, so you'll either need your own transport, a taxi or hired vehicle with a driver-guide to get there, or you could walk it from the Peace Memorial Park and back (or to the bus stop). Time required: it only takes a few minutes to see the monument(s), and looking around the cave area should add no more than another 5-10 minutes or so either. 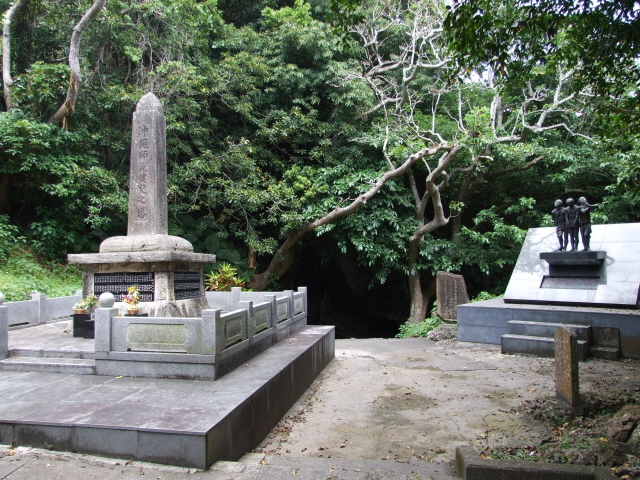 Combinations with other dark destinations: in general see Okinawa – the Okinawa Peace Memorial Park is just round the corner, so it makes most sense to tag a visit to the Kenji monument & cave on to that. Another, somewhat more dramatic cave of a similar nature to look out for in the vicinity is Todoroki cave (if you can find it - you'll need a guide! ).